An alluring strangeness fuels this debut feature from director Anders Walter which combines touching coming-of-age drama with eye-catching magical realism. Based on a graphic novel by Joe Kelly (who also adapts the screenplay), I Kill Giants follows the journey of high-schooler Barbara (Madison Wolfe) who envelops herself in a fantasy world to cope with her upsetting reality. While this premise is hardly thematically ground-breaking (comparisons with J. A. Bayona’s A Monster Calls are inevitable), I Kill Giants maintains a fresh, appealing energy thanks to its focus on almost exclusively female characters. Barbara lives within a dysfunctional family home where her inconsiderate brother loudly plays video games and her old sister Karen (Imogen Poots) struggles with her new responsibility of house caregiver. 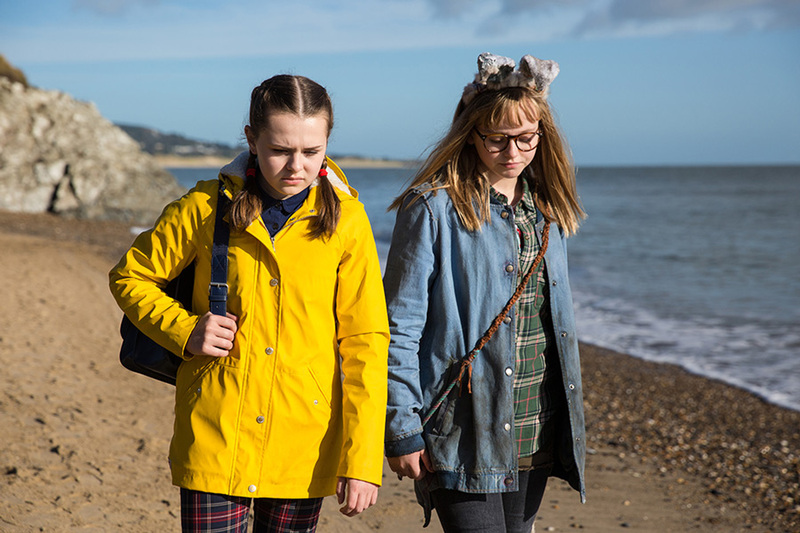 Feeling equally ostracised at school, where she is the victim of bullying, Barbara occupies herself with defending her costal town from sinister giants who she believes will cause destruction. Barbara undertakes this task alone, setting traps and making magic potions, until she befriends new girl Sophia (Sydney Wade) who joins her on numerous giant-slaying missions. But, as newly appointed school counsellor Mrs. Mollé (Zoe Saldana) tries to get Barbara to open up, she is gradually forced to confront the traumatic reality of her personal situation. The giants themselves, although imaginatively designed, are a little unconvincing and too often shrouded in darkness. Despite clear budget limitations, the film’s impressive use of sound design helps give the giants a creepy, malevolent offscreen presence through a cacophony of eerie groans and otherworldly noises. Laurent Perez Del Mar’s enchanting score adroitly complements the film’s striking, evocative visuals, helping create a weird, fairy-tale atmosphere. What really sets I Kill Giants apart from other similarly themed films is its impressive female-led cast. The narrative is driven by the relationships and interactions between its lead female quartet and each brings bucket loads of personality to their individual characters. Wolfe particularly excels in her first lead role, she terrifically capturing the complex emotions of adolescence and creates a compelling, empathetic protagonist. While Barbara’s sister Karen and teacher Mrs Mollé receive an unsatisfying amount of character depth, it’s still invigorating to see this much female representation on-screen. The truths behind Barbara’s fantasy world come to light in the film’s third act and although the revelations are unsurprising, Walter explores issues of death and grief with sensitivity yet never dips into over-sentimental territory. I Kill Giants is a poignant meditation on the power of imagination in the face of emotional trauma and its refreshing emphasis on female stories has produced an empowering, uplifting coming-of-age adventure.